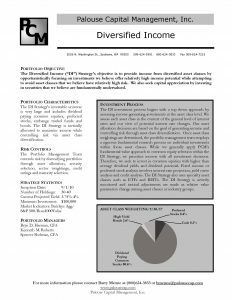 PCM’s Diversified Income (“DI”) strategy is managed to generate income and long term capital appreciation. The DI strategy’s investable universe is very large and includes dividend paying common equities, preferred stocks, exchange traded funds and bonds. The DI strategy is tactically allocated to maximize income while controlling risk via asset class diversification. While we generally apply PCM’s fundamental value approach to common equity selection, we prioritize income with all investment decisions. Therefore, we seek to invest in common equities with higher than average dividend yields and dividend potential. PCM’s DI strategy is team managed.